I wanted to do a story that featured vampire squids or vampire finches for a long time. Originally the third episode of Transyltown was going to feature Timmy going to school, but I decided to do a few summer adventures to have the audience spend more time with Timmy, Alicia, and Luna before adding more cast members. I had a beach monster story idea that I was waiting on and decided it was a good time to use it, and could finally use the vampire squid! I love superheroes, but they can be a bit problematic if they really existed. Johnny Calamari represents some of the awkwardness of superheroes. He carries the image of being dark, mysterious, and awesome, but he’s really a violent dork. 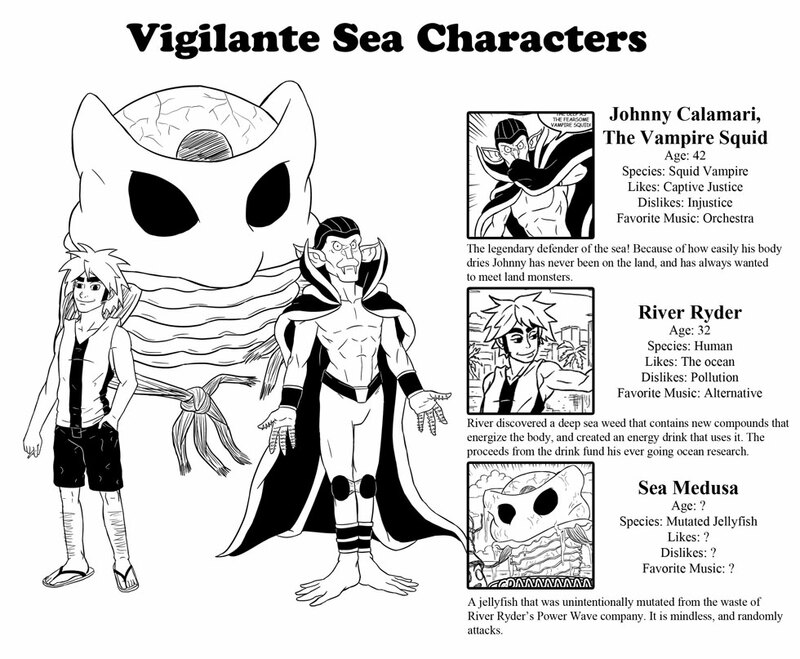 When I was drafting Episode 4 I wanted to make a company responsible for Sea Medusa’s mutation, but when I considered that the antagonists of the last episode were people running a business I felt that if I wasn’t careful things would feel like Captain Planet, so I quickly decided that River would not be an antagonist, and would be likeable, and kind of cool. I’ve never really like how stock scientists in stories can be. I wanted River to not be the typical depiction of a scientist. He would have a look that reflected his interest in the ocean, and look pretty cool, so I went with a beach look to him. Shaggy from Scooby-Doo and Sanji from One Piece were images that came to mind when I was designing him. In my list of ideas for Transyltown plots one of the first ones jotted down was a beach monster story mimicking Jaws, but I’m not really afraid of sharks. You know what does terrify me? Jellyfish. Small ones, large ones, it doesn’t matter. They lack brains, they sting, and some of them are crazy toxic! That’s the beach monster I wanted to draw, and thus Sea Medusa was born! The titular creatures of the Metroid games, the Pokemon Tentacruel, and the horrifying looking lion’s mane jellyfish (I really find jellyfish creepy) were my original basis for the design. I find blank emotionless stares to be frightening, so designed Sea Medusa to have one. For fun I bunched up the tentacles into hands to stage different ways to weaponize them.